"This is the easiest punch recipe ever. It was a big hit at my sister's bridal shower." 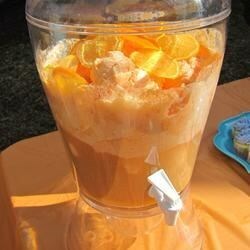 Place sherbet and frozen orange juice concentrate in a punch bowl. Allow to thaw for 10 to 15 minutes. Stir in ginger ale. See how to make a lemony, light, and refreshing punch. I make this punch for a baby shower...and I ran out! It was a hit! Just be sure to let the sherbet sit out a while before making the punch. Pretty...but way, way, WAY too sweet...and I have a sweet tooth! I will be trying to figure out a way to cut the sweetness as it does have potential. This punch was real easy and fast to make. It taste more like orange juice than a punch. Next time I will mix 1/2 sherbet with 1/2 vanilla ice cream and try that. I have used this recipe often and everyone loves it. I recently tried it with lime sherbet and concentrated Limeade and it was wonderful. Great and easy punch! Everyone wanted seconds and after shower they all wanted the recipe!